I meditated on what it should be. An ape will think his best, swinging from a tree; but me, I do my clearest thinking sound asleep. Dr. Screech thought it was a shadow at first. Or a piece of dandruff on his eyelash. But dandruff doesn't make a buzzing noise. And it doesn't have a face. And it certainly doesn't wear glasses! Well this was a fine how-do-you-do! Dr. Screech had only laid down his trumpet a few minutes, and had only started sighing mournfully a few seconds, and now this! "The practice fai­?" Dr. Screech moaned. "My mommy didn't tell me to expect this!" 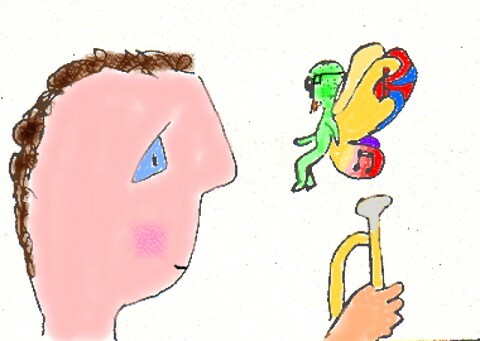 Dr. Screech was only 10, and his mommy had rented the trumpet for him only a month ago. Dr. Screech had been so excited at first, yet he was already thinking of quitting. "That's because NO one, knows when to expect me." "Did I do something to deserve this?" "Yes, two things", the practice fairy observed. "First, you are holding a musical instrument and not making any sound. Of course a lot of kids do that and I never appear to them, because they aren't the second thing, which you are. You are a cartoon. I only appear to cartoons. Of course, your being a cartoon also explains the first thing, why you aren't making any sound." "I see." Dr. Screech scratched the back of his head, hoping to renew the circulation in his brain which had just started to go numb. "Well, this is nice of you." Dr Screech brightened: "Now I can talk to you and I won't have to practice!" "HAVE to practice??? You mean you CAN'T WAIT to practice? I don't believe my ears!!" "Eyes, remember? The cartoonist didn't draw any ears on us." "Oh yes. But isn't practicing the most exciting thing in your day?" Dr. Screech couldn't believe HIS ears. Er...oh well. "Er, I don't think so." "Name one thing that is more exciting!" The Practice Fairy held up his hand in a "stop sign" gesture and wrinkled his tiny eyebrows. "Wait a minute! Let me get this straight. When you watch TV you are sitting for hours at a time without hardly ever moving, not even your eyes, right?" "I, er, well kind of, but..." Dr. Screech was exasperated. Couldn't the Practice Fairy understand ANYTHING?! Dr. Screech was certain he had a good answer for the Practice Fairy, but he didn't know why he should have to take the time to think of it. "But you don't think practicing is exciting?" "Ah, maybe a little", he answered the Practice Fairy. "But it's so hard. I'm worried." Tears welled up in Dr. Screech's odd­looking cartoon eyes. "That it will take so much work that I will have to give- up other things I like. Like sitting around and doing nothing, or getting into trouble. And that even after I do that, I'll never be any good." "I see. While you are already good at watching TV?" "What?" Dr Screech's tear glands temporarily shut down to await further orders from Dr. Screech's confused face. "And it didn't take you very much work to become good at watching TV?" That was it! THAT was what he liked about TV! Dr. Screech smiled widely. "Oh no! A baby can do it!" "So with very little effort of watching TV, you can acquire a skill that you can be proud of?" "What?" This was getting very confusing. Did he ask if TV watching was a skill one could be PROUD of? "How many songs can you play on your instrument?" "Only about half a dozen. But there's only one or two I can play real good." "And how much practicing have you done every day?" "Well, I'm supposed to practice 30 minutes a day." "Let me run this question by you again. How much, practicing have you DONE every day?" "Oh. Well, LAST week I practiced 30 minutes.",. "I see. And how many other kids in your room can play that many songs on a musical instrument?" "Then if you can already do something that only one in ten children can do, even though you hardly ever practice outside your lesson, and when you DO 'practice' you sit there sighing with your trumpet on your lap half the time, how can you worry that you can never be any good?! You are already better than most. Think how incredibly awesome you would be if you practiced the way you promised you would!" One of Winton's airy solos begin to wind its way through Dr. Screech's inner ears. (He didn't HAVE any outer ears.) His inner eyes saw himself as the source of those glorious strains. But how could­­? Dr. Screech bowed his head. His tear ducts came alive. He prayed to Jesus for help. He felt so helpless. So inadequate. Then he remembered the Sunday School lesson on faith. "If you have faith, then if you ask for something good in prayer, you can move mountains." (Matthew 7:7­il, 21:21­22) Dr. Screech prayed. The Practice Fairy waited, smiling. When Dr. Screech relaxed the Practice Fairy asked, "While you are developing your-musical talents, what talents do you suppose the other kids in your room are developing? Dr. Screech's eye caught a glimpse of the TV. He remembered that's what he would be watching now if it weren't for the trumpet and this amazing conversation. He stared at the TV. He pictured all the kids in his class, except two, watching it even now. The whirring came closer. The Practice Fairy was only an inch from the side of Dr. Screech's face. He whispered,, "Did you say TV was more exciting than practicing?" Dr. Screech turned back to face the Practice Fairy. He looked cross­eyed because the Practice Fairy was so close. Dr. Screech turned back to stare at the TV. He looked at his trumpet. His tears started again, but this time he had a bigger smile across his face than when he was happy! He picked up his trumpet. He could hardly see the music through his tears, but he played the song he knew. It sounded better than it ever had before! What was he doing different? He had faith! He wasn't afraid! Wow! He turned to the next page in his music book, a page his teacher hadn't even shown him yet. He looked at the first few notes of one of the songs. The notes looked familiar! He knew he could play them, in just a matter of time. He began to play them! How could this be? He was playing music he hadn't even been taught to play! He played all the way to the end. That sounded familiar. What was it? But he had played it so slow it was hard to put the tune together in his head. Maybe if he played it faster he would recognize it. He played it again, seeing how fast he could go. And again. And again. Downstairs, -Dr. Screech's mom heard unusual sounds over the clatter of cooking. What was wrong? She stopped - her work and listened. Was one of Winton's tapes jamming? No, that couldn't be. Was Dr. Screech bothering the dog again? She had to investigate. She walked- quietly up the stairs, in awe, afraid to believe, still mechanically drying a - serving dish without even realizing she still had it. She came to the top of the stairs and peered in the door. She dropped her dish. Her mouth flew open so wide a school of gnats could have flown in without breaking formation. Dr. Screech didn't hear the dish breaking, but kept right on playing. down and put her hand over her astonished, rapidly heaving chest. The Practice Fairy whirred downstairs and smiled at mom. Mom asked him, "Wha­? How'd you do it? How'd you get him to practice?" The Practice Fairy was puzzled. "What do you mean, how did I GET him to practice? How can anyone ever not CAN'T WAIT to practice?" Mom gave the Practice Fairy a quizzical look and continued: "I've been threatening him that if he doesn't start practicing we'll have to take the instrument back." "I see. And is that the same thing you told him about the TV, that if he doesn't watch it you will take the TV back?" "? What? Do you have trouble thinking? Look, I don't WANT him to watch so much TV. I want him to practice!" "I see." The Practice Fairy was trying to put it together. "Then if you take the instrument back, to punish him for watching TV instead of practicing, will he have less time to watch TV? Will that be your punishment?" Mom saw the hole in the Responsibility Environment she and her husband had created for Dr. Screech. "Er, no, he will have more time to watch TV", she conceded. "I apologize for my memory. 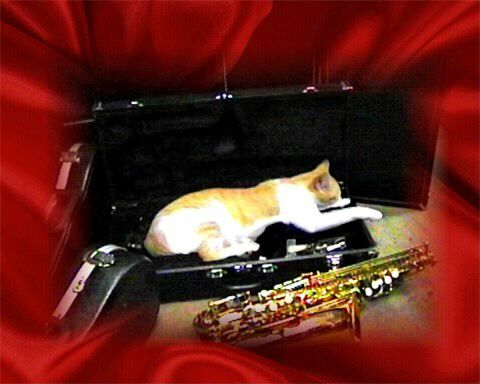 Did you characterize your offer to return his instrument as a 'threat'?" It was mean of him to be sarcastic after mom had already admitted she was wrong, but Mom wasn't mad. She could take criticism a lot better than Dr. Screech could. She even appreciated criticism if it was true. But she was still confused. "But he has to learn the value of commitments. He has to learn that if we make a commitment to spend two hundred bucks on an opportunity for him to develop his talents, he had better have the self discipline to take that bull by the horns or we're going to take that opportunity away and just leave him to sit around in front of the TV and see how he likes THAT!" "Of course, that's a lot of money we' re talking about", the Practice Fairy sympathized. "What will you do with all that money if you don't spend it on an instrument?" "Well, Harry and I have been -thinking. Either a down payment on a satellite dish, or on a big screen TV." "Say, you know, now that I think of it, you look familiar." "Yes. Why yes, do you remember 25 years ago? You were playing a Fnorq. Don't you remember?" "Oh yes! B­but how did you-­"
"And I came to visit you then. Didn't do any good, though. You quit." "40 feet long, the. instrument was, with the mouthpieces 35 feet apart. You needed track shoes to play it. Great instrument! "But I wouldn't practice enough, so my dad took it back and bought a bass boat. He said he was determined to have music in the family one way or another, and if I wasn't going to put it there he was going to go out and sing bass to the bass." "You learned to play Happy Birthday for your Grandpa's 60th birthday before he took it back, though, didn't you?" "He thought so! He was so out of breath by the time you got through, that he couldn't blow out the candles and you had to!" Dr. Screech stopped playing. He had played 29 minutes. Mom heard the trumpet case being closed. She heard the TV being turned on. 29 minutes! That was the best he had done so far. If only he would practice every day! But what if tomorrow came and it was like yesterday? "How can I get Dr. Screech to practice?" she pleaded. "You mean other than by threatening to take away something that is eating up his TV time?" "Yeah. I've tried that, and that doesn't seem to be enough." Mom knew how to be sarcastic right back. "Well, how much allowance do you give him?" "If he would practice 30 minutes every day, would that be worth another $1 a week to you?" "Well, you could pay him his allowance at the rate of 2 cents for every minute he practices. Then if he practices 30 minutes every day he would have a raise! Or if he practices an hour a day, you could tell him you will match what he earns and save it for a new trumpet at the end of the year! "Does he like to go to bed?" "He HATES going to bed!" "You could say, 'Well, Dr. Screech, it's time to go to bed now. Er, unless you want to go practice first.' When he gets through practicing, he will be ready for bed! "Does he like to clean his room?" "He NEVER cleans his room!" "You can tell him, that he needs to go in his room for 40 minutes and either clean or practice. Whichever he chooses will bless him and help him grow. Even if he never chooses the trumpet, if that trumpet was what it took to get him to clean his room, wouldn't that trumpet be worth it even if he never plays it?!" Mom relaxed at the very thought of not having to clean his room any more! It had been awful ever since grandpa got him that Ghostbusters Slimegun! But mom soon thought of how creative Dr. Screech could be at circumventing her most devious schemes to coax him to do what was in his own interest, which he wouldn't do simply from an appeal to his reason, or out of love of obedience. She pleaded again, "I just don't know, Mr. Fairy. I've been raising Dr. Screech by a wonderful book recommended by his school counselor called 'Child Raising Gimmicks for the New Millenium', but it seems like just about the time I get comfortable with a gimmick, he figures it out and uses it against me. Then I have to go learn another gimmick. I'm just glad the book is in 40 volumes or I wouldn't know where to turn! But I had to quit work just to catch up on my reading, and frankly it's getting me frazzled!" 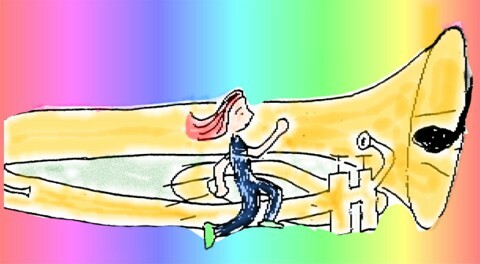 The Practice Fairy's head was spinning, just thinking of such a merry­go­round. He almost lost his balance, and: had to land on a flower for a rest. "If it takes you that much work to stay ahead of him, think how much work it must take for him to keep up with you! I feel sorry for both of you! Look, what you need is a bottom line." Mom was shocked. His statement sounded vaguely illegal. "You don't mean...the 'S' word?" The Practice Fairy didn't answer directly, because he was talking about general principles. "The bottom line is whether you are going to allow your child to grow up without developing his talents. Gimmicks are like sugar in medicine. The important thing is the medicine. The gimmicks make it less work to go down., But it must go down! If Dr. Screech says he doesn't care how much sugar you put in the medicine, he still won't like it, then at that point you have to tell him that you do care that he doesn't like it, but neither of you has any choice but that he must take the medicine! "No child can fully develop his talents without some prodding, Some 'being forced'. Adults can't, either! Hunger sometimes has to be the bottom line that prods adults. Parents shelter their children from that most desperate pressure, .but when gimmicks aren't sweet enough any more, parents must be willing to do whatever it takes to get the medicine down. "When you can get your child to take the medicine with sugar, that's fun. When you make your child take the medicine even when he doesn't want to, that's an opportunity too, because then you are teaching him responsibility." This all sounded so harsh to mom. Her husband had talked like that too, sometimes, but mom just didn't know. "But if I am stricter about music than any of his other responsibilities-, -he will just hate music." make music a synonym for slave labor in his mind. If you believe 5 minutes a day is his capacity for any other work, then perhaps you should be content with 5 minutes a day on the trumpet. "But I know Dr. Screech has more capacity than that. I know you want him to develop his talents and mature. And not just on the trumpet. In his whole life." "As you get a feel for Dr. Screech's potential, are you going to allow it to go undeveloped, or are you willing to push your little bird out of his nest of least resistance and make him fly?" With that the Practice Fairy shot into the air and whirred upstairs. Mom could hear the TV clicking off. She could hear Dr. Screech's howls of- protest. 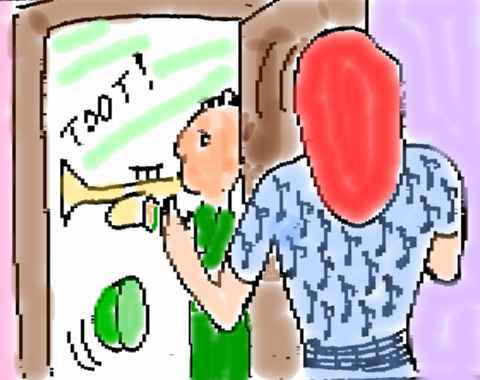 She could hear the trumpet case latches being unfastened. Then she heard the most sublime trumpet music she had ever heard. It was like the music she heard in her head before she got the Fnorq, and that had died as her faith had died, and as her commitment died. It was music like that seldom heard on earth. It was the music of great goals. The music stopped. Mom could hear a chair squeaking, a music stand being adjusted, a throat being cleared. A­­ a prayer being offered? Then she heard music much less splendid, but as precious to her as music from heaven: the music TO heaven from her very own son. The crude rough music of talents being developed. The painful, clumsy, first baby steps down the road to achievement. The selfless willingness to take up a burden that often becomes heavy and tiresome, in order to develop an ability to serve others at some unknown future time perceived only through eyes of faith. Mom heard a whirring from the stairs shoot past her and through the closed window. She knew the "magic" would return only seldom and only on its own schedule, and that it was up to them to keep going in between times, on raw commitment and work. Dr. Screech was still practicing. Still practicing. An hour and l0 minutes of practicing, and he hadn't quit. Mom pulled down her Bible from a shelf It had been so long! Let's see; was the New Testament at the beginning or the end? She thanked God. She began to read. She wondered if she should get another Fnorq. Was it too late? Was she too old? As she read, she determined that, meanwhile, she would never be too old to dust off a few undeveloped talents of her own, still needed by those she loved.